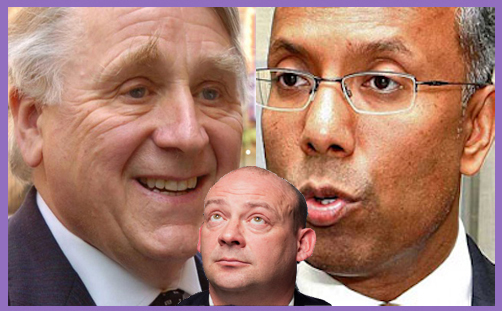 Giles Fraser (pictured centre) has written a perfectly-pitched (yes, indeed) piece, ‘Is it one rule for the Hindus and another for the Muslims?‘, which relates to the judgment in the case of Lutfur Rahman (pictured right), whom Judge Mawrey (pictured left) found guilty of inter alia the crime of exerting ‘undue spiritual influence‘ on his fellow Muslims in order to bolster his chances of being elected Mayor of Tower Hamlets. It seems democratically peculiar (not to say politically erroneous) that an 18th-century law should have been reiterated in the Representation of the People Act 1983 (§115), out of concern at the “power and influence of religious office”, which (it appears) must be singled out for particular restrictions on the usual freedoms of expression permitted during an election campaign. Giles Fraser is absolutely right about this (yes, indeed): there is as much ‘undue spiritual influence’ exerted by certain Hindu spiritual leaders (not to mention Sikh, Buddhist, Christian and Jewish sermonisers) as there is by the imams of Tower Hamlets. For Judge Mawrey to single out the Islamic Ummah as being particularly more susceptible to that influence (by virtue of their being a less sophisticated, lowly educated and politically illiterate community [these comparative terms drawn from Mawby’s judgment]) is based on an extraordinarily jaundiced view of Muslims in modern Britain. Perhaps it was Mawrey’s penchant for rhetorical flourish (“hapless clerics”; “ecclesiastical bleat”; “politics has gone to the dogs”): his judgment appeared to be written with one eye on a Daily Mail headline and the other on his Thesaurus. Like Patel’s letter, the imam’s letter contained no sense of threat, nor implication of any spiritual consequences for those who chose to vote otherwise. Yet in an astonishing display of double standards, the Imams letter was used to void an election result and Patel’s letter has passed without mention. Which is why one could be forgiven for concluding that someone has it in for one particular community here. For just like English attitudes towards the Catholic Church in the C19th, English attitudes towards Islam often regard it as some malevolent and foreign power, requiring exceptional legal treatment – including silencing them at election time. If there be no threat of physical harm to person or property, or, indeed, not even the inference that Muslims who fail to vote for Rahman stand to forfeit their virgins and lakes of wine in the hereafter, where is the crime? Indeed, where is the spiritual influence? This cavil is not to suggest that Rahman was in any sense innocent: it is simply that the judgment of his guilt in vote-rigging, bribery and corruption etc., etc. is tainted ever so slightly with an injection of dubitable spiritual infraction, which is (or ought to be) no violation of the law at all. Mawrey has indeed “opened the most enormous can of worms”, as Fr Giles warns. But it’s more than that: it is a Gordian knot, hornet’s nest, Pandora’s box and a knot of vipers. In a legal opinion by Martin Chamberlain QC (whom Fr Giles commissioned, to his great credit [Chamberlain is no bleeding-heart lefty-liberal rights advocate]), it may be seen that Mawrey’s judgment is inconsistent not only with our own traditions of freedom of speech, but with the European Convention on Human Rights as it relates to the freedom of expression. In any event, by virtue s. 3 of the Human Rights Act 1998 (the HRA), s. 115 must, so far as possible, be read compatibly with Article 10 of the European Convention on Human Rights (ECHR) (which guarantees the rights of the clergy to freedom of expression and the rights of members religious communities to receive the views of their religious leaders) and Article 14 ECHR (which guarantees the right to enjoy that freedom without discrimination on grounds of religion or membership of a profession). The prohibition in s. 115 can and should be read narrowly so that a member of the clergy might commit the offence by urging his congregants to vote for or against a particular candidate on pain of excommunication or expulsion from a religious group. But there would be no offence in merely expressing a view about the merits of a candidate at an election; nor in urging congregants or others to vote for or against a particular candidate; nor in asserting a moral or religious duty to vote for or against a particular candidate. It cannot be a crime for a member of the clergy to use “the power and influence of religious office to convince the faithful that it is their religious duty to vote for or against a particular candidate”, as Mawrey says. Not least because, as Chamberlain makes plain, “it would be very difficult to predict in advance whether making a particular statement would or would not amount to the commission of the offence”. We must thank the good Rev’d Dr Giles Fraser for pursuing this important matter of religious liberty: “undue influence involving the threat of spiritual injury” belongs to another age. Let the clerics of all faiths preach their notions of truth, justice and dignity. Let them proclaim their apocalyptic invective against political candidates and their parties. As long as worshippers are permitted to protest and nail their theses to the doors of the local cathedral, church, mosque, temple or gurdwara, it ought to be no crime at all to exert spiritual influence. Absent the threat of physical harm, what business is it of the state to discern and determine whether that influence is ‘undue’?